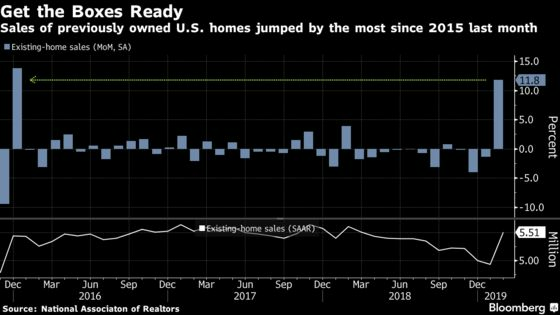 (Bloomberg) -- Sales of previously owned U.S. homes rebounded in February to the fastest pace in almost a year, topping estimates and snapping a three-month streak of declines to offer a robust indication that the housing market is stabilizing after last year’s slump. Contract closings increased 11.8 percent, the most since 2015, from January’s pace to a 5.51 million annual rate, the National Association of Realtors said Friday, exceeding all forecasts in a Bloomberg survey that had called for 5.1 million. The median sales price climbed 3.6 percent from a year earlier. The surprisingly strong gain, which was driven entirely by single-family homes, indicates that the lowest mortgage rates in a year, resilient consumer sentiment, and the Federal Reserve’s pledges to remain patient on interest-rate increases are helping to stabilize housing markets after sales tumbled in 2018. Single-family home sales jumped 13.3 percent to a 4.94 million pace amid strong gains in the South and West. The pace of condo sales was unchanged at 570,000. It may take some time to determine whether the rebound is sustainable or mainly reflected a boost on pent-up demand from buyers who were waiting for more attractive mortgage rates. Low supplies could act as a constraint on sales, and purchases were still down from a year earlier. Other recent reports have shown new-home construction rebounded in January while sales of new single-family houses cooled. Home-price gains have also been generally decelerating since early 2018. Home purchases advanced in three of four regions, led by a 16 percent gain in the West. The Northeast was unchanged. At the current pace, it would take 3.5 months to sell all the homes on the market, compared with 3.9 months in January; Realtors see anything below five months of supply as a sign of a tight market. First-time buyers accounted for 32 percent of sales, up from 29 percent the prior month. Existing-home sales account for about 90 percent of U.S. housing and are calculated when a contract closes. New home sales make up the remaining 10 percent and are counted when contracts are signed.